Looking for some Google tips and tricks right at your fingertips? 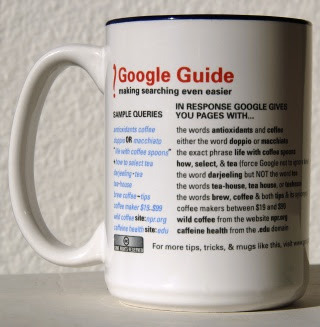 Then consider having this Google Guide Coffee Mug. This is a cool mug by Nancy and Tasha where you can print the PDF file and have it printed on your plain coffee mug or just cut it out and paste it. The top set of queries includes examples of Google operators and the lower set illustrates shortcuts to specialized information. The guide shows you what to type or query about and it will give you what Google will respond with or show. For example, if you type "brew, coffee~tips" then the words brew, coffee & both tips & its synonyms will come out. I really haven't mastered how you can maximize or search the exact things that you are looking for in google but this is a great start. Hope you enjoy the mug and become better in searching things at google. For more tips and tricks please visit their site. What a great idea. I love coffee, collecting coffee mugs, and google. I'll have to look into that. Yup same here! I never knew that there were tips in searching in Google. All I do is just type what I want and just wait for the results but now I know that there is a better way in searching for what you need.